The much-anticipated musical episode of Once Upon A Time is finally here, and it’s an instant hit. The originality of the episode is the best since the first season of the show, with the song lyrics shining. Through a lot of song and dance, a new story is brought to light that actually is tear-provoking when its purpose is revealed. With the music accompanying Emma and Hook’s wedding, there’s nothing not to love — after all, music accompanies fairy tales very well. Most of the singing takes place in a flashback to the Enchanted Forest. We have seen some long lost stories this season, and this is another fun one to explore. Snow White and Prince Charming are concerned about their unborn daughter’s safety, with the impending wrath of the Evil Queen. Snow wishes that she had a way to keep Emma safe and give her a chance for a happy ending. The Blue Fairy hears Snow’s wish and decides to grant it by making everyone break into song to express their feelings. Why make everyone break into song? Snow’s wish was so powerful that Blue wanted their love to be the most powerful magic of all (more on that to come). With the best opening to a show ever, Snow and Charming wake up and start singing an epic ode to their love. The best part of the number is the first few lines, where they are both terribly confused at why they are singing. Since everyone is aware that the situation is weird, there is instant comedy laced throughout the episode. Each song’s placement makes a lot of sense, so the whole concept of a musical works pretty well. The eight-song soundtrack of the episode is fantastic for many reasons. Every song’s lyrics were perfectly crafted by Alan Zachary and Michael Weiner. Each lyric had a purpose and furthered the story, both in the Enchanted Forest and Storybrooke. This shows that the lyricists really thought about how to have successful storytelling through song, much like a Broadway show. The actual music was great too and combined well with the lyrics. The songs are all very catchy, especially Snow and Charming’s “Powerful Magic,” which starts the show. “Charmings vs. Evil Queen” is another fun track, as the Charmings face off against Regina in her castle. The soundtrack also offers lots of different voices and types of songs. Snow, Charming, Regina, Sydney (the Magic Mirror), Granny, Geppetto, Grumpy and the dwarfs, Hook, Zelena, Emma, and Henry all lend their voices to the songs. Regina, Zelena, Hook, and Emma each get solo songs, with Regina and Hook singing rock ballads. While some of the songs are corny, they clearly are meant to be fun and silly. The cast did a great job putting themselves out there for this episode, and it really did pay off. “The Song in Your Heart” is easily the best episode of the season and will make you smile from beginning to end. So, what is the real point to all the fun singing? About two-thirds of the way through the episode, the singing stops in the Enchanted Forest. Blue comes to console a helpless Snow and reassures her that there was a good reason for her to grant the wish. Blue says that the song wasn’t meant to beat the Evil Queen before the curse is cast — rather it is for Emma in the future. The song will give Emma a chance in life and put a song in her heart, which she will use to defeat the true evil as the savior. Blue promptly takes everyone’s memories away, which explains why this hasn’t come up sooner in the show. We also learned that the Charmings met Hook during this wish in the Enchanted Forest — not that any of them remember. Back in Storybrooke, it is Emma and Hook’s wedding day. Emma has decided that she will wear Snow’s wedding dress, but the Black Fairy obviously has to ruin it. It is revealed that the Black Fairy has taken all her fairy dust to the clock tower and will be releasing it promptly at 6 p.m. as a wicked curse — which is also the time of the wedding. The theatrics and mind games continue when the Black Fairy gets in Emma’s head by telling her she won’t be able to fight her alone and will lose the final battle. Regina and Zelena figure out a way to stop the Black Fairy by isolating the time component of Regina’s Dark Curse. However, they are stopped by Rumple (who is the only main character to not sing, by the way). The Black Fairy uses the time potion to freeze all of Emma’s family and friends in Regina’s office, which is a great setting for the first part of the battle. Thanks to some previous help from Henry, Emma realizes that she isn’t alone and literally finds the song in her heart after the Black Fairy tries to crush it. Emma realizes that her heart is stronger than most because she has this magical song inside her, which turns out to be her hidden strength. Set to the show’s theme song, Emma breaks out into the most beautiful song of the episode. The lyrics are inspiring and brought tears to my eyes. Emma finally believes in herself and becomes the hero that she has forgotten she can be by saving everyone through her song. The song is also powerful enough to make the Black Fairy back off for the moment, which allows the wedding to commence. 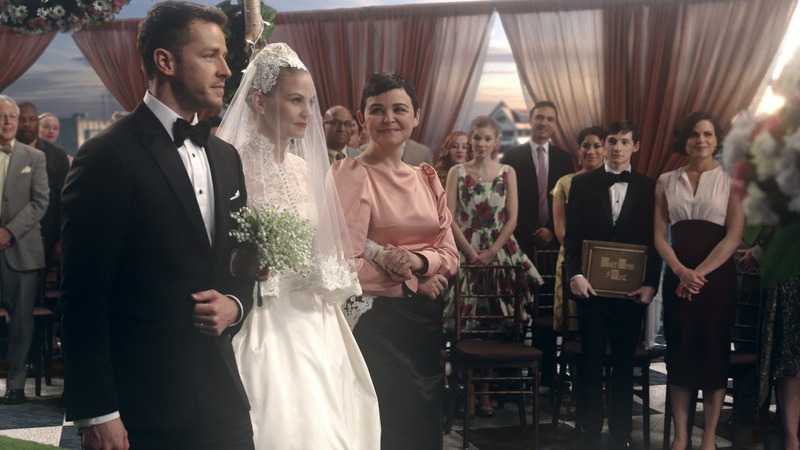 With a beautiful evening ceremony, Hook and Emma have their fairy tale wedding after all. Jennifer Morrison looked beautiful in her vintage dress and make-up. I loved that they used her costumes throughout the episode to parallel her emotions — she starts the episode looking very messy and nervous and turns into a confident, stunning bride. Colin O’Donoghue also looks dashing in his all-black suit. It was also funny that Archie officiated the ceremony. The wedding was an opportunity for a lot of familiar faces to reappear in the crowd. After announced as husband and wife, the whole ensemble breaks into a final song all about how this is a happy beginning, not a happy ending. 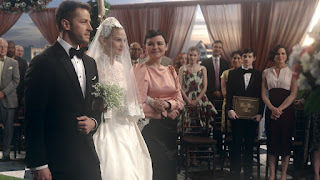 This is a great nod to the entire concept of Once Upon A Time, as the show has gone past the happy endings to see what happens next for the past six years. This is also a great way to show that the series will be rebooted if there is a seventh season, like creators Adam Horowitz and Edward Kitsis have promised. With the two-part season finale being the only episodes left, the final battle will have to occur in full. The Black Fairy’s curse does come at the very end of the episode, which the characters feel will take them to another land. I’m not sure if I missed a line or something, but it was unclear why they think they are being transported elsewhere instead of the curse affecting their current home. It would be cool to see everyone in another land, but where else could they possibly go? This article was written prior to the season finale promo airing, so the answer may be revealed ahead of the finale. Everyone involved in this episode deserves a huge round of applause. It was wonderfully executed, directed, acted, and written to bring Once Upon A Time back to what originally made it a special show. Musical episodes don’t always work well with their respective shows, but this was a match made in heaven. If Once Upon A Time does return which I am hopeful it will, I would love to see another musical episode next season. Ginnifer Goodwin and Josh Dallas had the best voices, even though Goodwin thinks she can’t sing. She has a great voice and should be proud of her work in this episode, as should the entire cast.